Grain sacks and faux grain sack stripes are very popular on Pinterest and in blogland. I decided to give painted stripes a try. 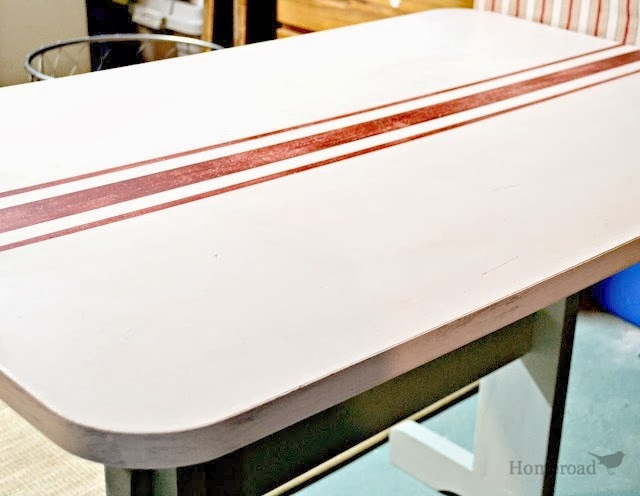 Here, Susan at Homeroad painted this laminate top table and gave it fun grain sack stripes. 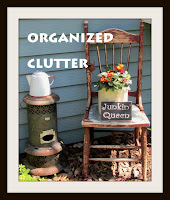 She now uses it as a folding table in her laundry room! I may try a table sometime too but my latest project is a faux grain sack painted frame. I had an "outhouse" theme in my small 3/4 bathroom a while back. I hung four black and white framed photographs of friends' outhouses located in close proximity to my husband's hunting shack. The outhouse theme has now been replaced with a vintage hanger theme. Since I was no longer using the them, I painted the black frames with "Old White" Annie Sloan Chalk Paint. I needed two coats to cover the black paint. I taped off stripes with masking tape. I sponged on Colonial Red paint from American Accents for a less crisp paint line, and a more "worn" look. I decided to just make the grain sack stripes on one frame. I am saving the other one for another idea. Then I printed out a script "No. 5" on picmonkey and traced the script with a graphite pencil on the back side. I then traced the graphite lines on the front bottom of the frame. I traced the faint pencil lines with a Sharpie black paint pen. I waxed the frame with ASCP soft clear wax. When the clear wax was dry, I applied some dark wax with a brush. I am still getting used to the dark wax. Even with a coat of clear wax on first, I find that you have to start wiping off the piece right away to avoid getting it too dark. Especially with white paint. Here is my finished frame. The taller gal in the back row is my great grandma and the older lady in the front row is my great great grandma. The others are my great grandma's siblings. The frame has extra wide, flat sides that are perfect for embellishment. This was a fun and easy project with a wooden craft store frame. Cute. I love red on white. Very cute. I've used grain sack striping before but hadn't thought about them on a frame. I love it! This is a really cute idea, Carlene...perfect for a wide frame like that! Thanks for sharing! Love how it turned out and I love grain sack stripes and ticking too. You should put No. 6 on it though since there are 6 people in the picture. LOL! Love your grain sack frame...it turned out great! !